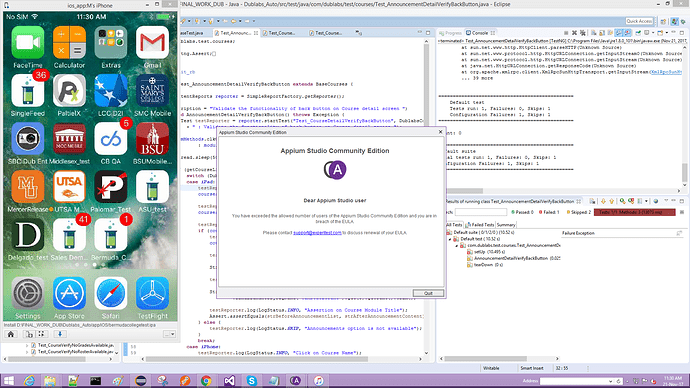 I am using Appium Studio Community Edition, I am facing license issue when i am trying to launch the Appium Studio, even after I am using this only for one user. Please contact support@experitext.com to discuss renewal of your EULA"
I’ve attached the screenshot of the issue, Please have a look and help me as soon as possible in this. We are also facing the same issue. and the Appium studio community edition is not launching due to the same error message. @Tom- can you please share some work around how to resolve this issue. But This is not related with license, as i am only the single user using this but why this kind of error is being displayed. Want to know what is the cause of the pop up error message. after 2 days onwards I am getting the below error. Please have a look and help me as soon as possible in this. Have you reached out to support@experitest.com ? I got this resolved by reaching out to Experitest. I have a feeling that there “user accounting” is not what most people would think it should be. Anyways, reach out…they will help. Seems they were able to figure out how many instances I had downloaded, when and where (I’ve used Experitest tools at multiple companies), and “adjust” my usage count. I did notice that if you’re like me, and keep multiple versions of Appium Studio around, it can work against you from a usage perspective. The “accounting” used to track usage seems a bit awkward, but they will work with you to get things cleared up. I spoke with Jonathan Ben Dov jbd@experitest.com. 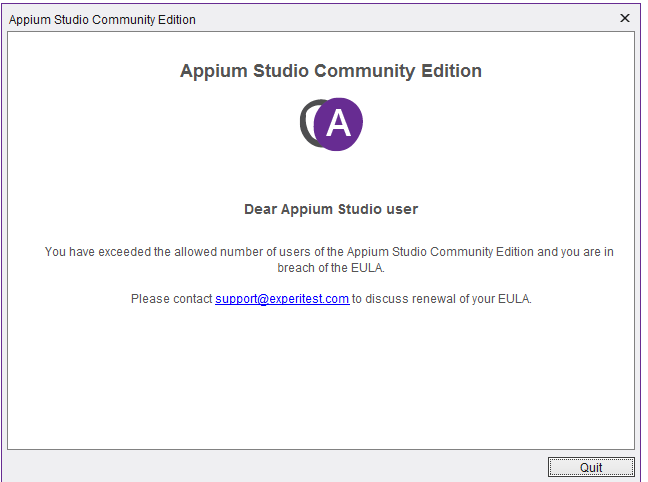 It just so happened that we were already in the process of purchasing licenses because we had more folks getting involved with Appium Studio. I wish I could help you. You need to reach out directly to Experitest, which is what I did. Work with them to get it resolved. Do you have a Experitest connection beyond this Forum ? I just got this message too. One thing I can say, it’s somehow connected to issuing adb commands while Appium Desktop is open. I’ve used desktop in the past 3-4 weeks, but these past two days had an open CMD window and issued few adm commands to take screenshot etc. I got the message within 5-10 minutes of doing that, so I’d say it has to do something with a bug. I don’t have any more Appium Desktop installations anywhere else, just this laptop.